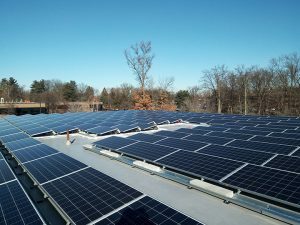 The Rosenblum Companies is pleased to announce that solar panels have been installed on the roofs of all three commercial buildings at Great Oaks Office Park. The system installed at Great Oaks can produce a total of 542 kilowatts (kW) of electricity, enough to power approximately 100 homes in upstate New York. Not only was the installation at Great Oaks the second largest solar project in Albany County in 2017 according to a Solar Electric Programs report by NYSERDA, it was also executed quickly; planning for the addition of solar power at the office park began in the summer of 2017, and by December, units at the three buildings were turned on. Rosenblum worked with Aries Power, a distributed generation developer based in New York’s Capital District, and Red Hook Solar based in Tivoli, NY. Aries Power has several solar projects and a microgrid under development in upstate New York; the company assists building owners in developing solar projects, including services such as project structure and financing. Red Hook managed engineering, procurement and construction for the project. 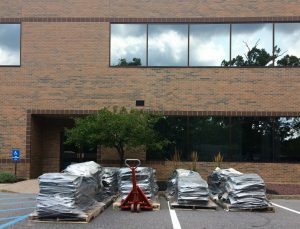 Carpet tiles at Great Oaks in the process of being recycled. The Rosenblum Companies has focused on providing more sustainable spaces for forty years. Some of the other environmentally friendly initiatives Rosenblum has implemented at Great Oaks include energy efficient LED parking lot lights, porous pavement parking lots to mitigate storm water runoff, construction material and carpet tile recycling, electric vehicle charging stations and free electronics recycling days. All three buildings at Great Oaks are also ENERGY STAR certified; commercial buildings that earn EPA’s ENERGY STAR use an average of 35 percent less energy than typical buildings and are responsible for 35 percent fewer greenhouse gas emissions. To learn more about our ENERGY STAR certification, click here.